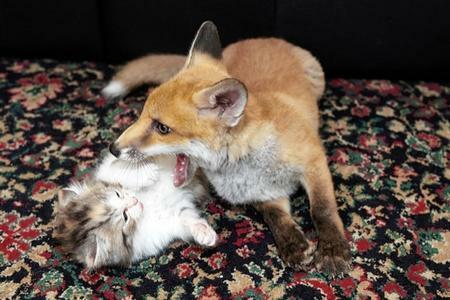 The fox kit had seizures and required IV drip when he first came to the Wildlife Service and has been handled and gotten plenty of human attention because of his serious condition. It was not known at first whether he would survive. 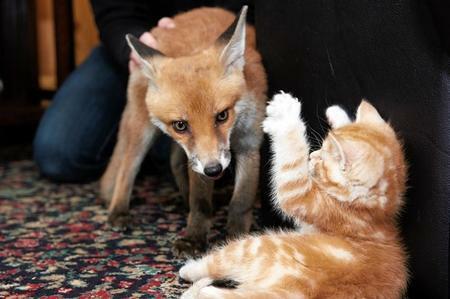 Lorraine St John has been hand-rearing the fox, and says the kittens that he has bonded, played and snuggled with during his recovery were abandoned, and came to her at about the same time as the fox. The fox has regained his sight during his recovery and will be moved to the Fox Project in Pembury before being returned to the wild in five or six months. For now, he has a special friendship with a very different set of kits … kittens. 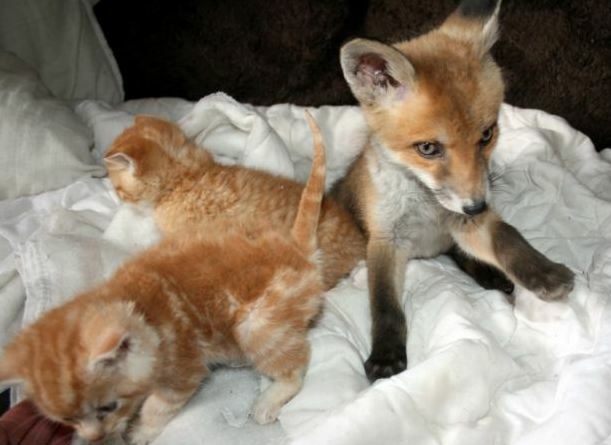 I am so glad that the little fox had friends to help him recover. What a sweet story. What a beautiful story. It’s like the lion lying down with the lamb.